This led me to a very important question, “Who is the person Jesus uses?” For I wanted to be a person Jesus could use and I wanted to raise up a generation of people that Jesus could use. Good leaders know what and who they are looking for and consequently have a better chance of achieving their ultimate goal. Take, for example, the Antarctic explorer Sir Ernest Shackleton, who placed the following advertisement in a London newspaper: “Men wanted for hazardous journey. Small wages, bitter cold, long months of complete darkness, constant danger, safe return doubtful. Honour and recognition in case of success.” Shackleton and his men did return to their homes safely, and were given honour and recognition. Jesus was another person on a mission. In the early days of his public ministry, his influence grew rapidly and there came a time where he took a strategic step to bring together a team of emerging leaders to train and raise up to serve with him and ultimately to take over from him. Perhaps the main reason why many churches remain relatively small today, is that their leaders are either incapable or unwilling to take this step. So, who is the person Jesus uses? Can we draw some conclusions from the way he went about calling men to join him and follow him? I think we can, and it was when I reflected on his calling of four fishermen in Luke 5:1-11 that I saw some key qualities identified in the lives of those Jesus called. It is of interest to note that Jesus did not recruit his men from Bible Colleges or Universities or the political arena. He largely found ordinary men in the marketplace, men with certain qualities. And we see in the calling of these four fishermen an important principle; He tested them to approve them and then to Entrust them with responsibility. How did he do that? Let’s follow the story. he would not have felt like serving. he was already busily occupied. he was asked to do something quite menial. he wanted to go home to catch up on some sleep. This incident reminds me of a person who said, “I don’t mind being called a servant. What I do mind is someone treating me like a servant.” Jesus looks for and uses people with a servant heart. Speaking of himself he said that he came “not to be served but to serve and to give his life as a ransom for many.” Matthew 20:28. Further, he gives great importance to the one who is willing to serve when he says,” whoever wants to be great among you must be your servant…..” Matthew 20:26.
he (a carpenter) asked them (fishermen) to do a task in which they were far more experienced than him. he asked them to lower their nets after they had been fishing all night and had caught nothing. he asked them to do something when they would have been far from feeling like doing it. They were tired and disappointed. It was important for Jesus to ensure that these men would pass the test of obedience before he called them to follow him, even to the point of offending their minds to reveal their hearts. His philosophy was that a person needed to become a follower before they would be entrusted with a position of leadership. He who cannot obey, cannot command. Authority is given to those who come under authority. of their sinfulness and the grace of Jesus. of their inadequacy and their total dependence on Jesus. that if they have Jesus and nothing else, that they have everything. Jesus spoke of the importance of humility when he said, “For everyone who exalts himself will be humbled. And he who humbles himself will be exalted.” Luke 14:11. Humility is the one characteristic that attracts the presence of God above all others. In Isaiah 57:15 the Lord provides us with his address where he lives : “I live in a high and holy place, but also with him/her who is contrite (meaning crushed or broken) and lowly in spirit……..” In other words, God uses broken people. Here Jesus mentions the job description he is calling these four fishermen to undertake. Here we find the fourth quality of the person Jesus uses, that of having a heart for people. The person Jesus uses will go through life leaving behind a trail of lives that have been transformed in Jesus name. They will be consumed with how they can continually be adding value to people. Their hearts will be broken by the things that break the heart of Jesus who, “when he saw the crowds, he had compassion on them, because they were harassed and helpless, like sheep without a shepherd.” Matthew 9:36. I have been surprised at times to find leaders who don’t seem to like people. This is not so with the person Jesus uses and so I continue to look out for people who display this deep quality of compassion and are willing to invest their lives in things that are eternal, people. One of my favourite axioms is this : “Jesus uses ordinary people who make themselves available to him, to do extraordinary things.” Jesus uses people with great availability more than those with great ability. Jesus wasn’t afraid to make big demands on people, for it is only then that he would get big responses from people. The founder of the Salvation Army, General William Booth, once said, “The secret of success for me has been that God has had all there was of me to have. There may have been men with greater opportunities: but from the day I got the poor of London on my heart, and a vision of what Jesus Christ could do, I made up my mind that God would have all there was of William Booth. If there is anything of power in the Salvation Army today, it is because God has had all the adoration of my heart, all the power of my will and all the influence of my life”. That’s availability. 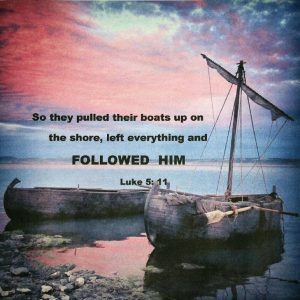 The story of Jesus calling of the four fishermen to join his team ends there. But there is one more quality that is vital. I am going to add five more words to the response of the four fishermen: “So they pulled their boats up on the shore, left everything and followed him” and never stopped following Him. The test of any person is what it takes to stop him/her. Unfortunately, studies show that few leaders finish well. And don’t forget, Jesus tests to approve to entrust. In what way might he be testing you right now in the specially designed leadership emergence program he has mapped out for you?